Talk about protection! Your spare change is safe and sound under the watchful eye of the Xenomorph queen. 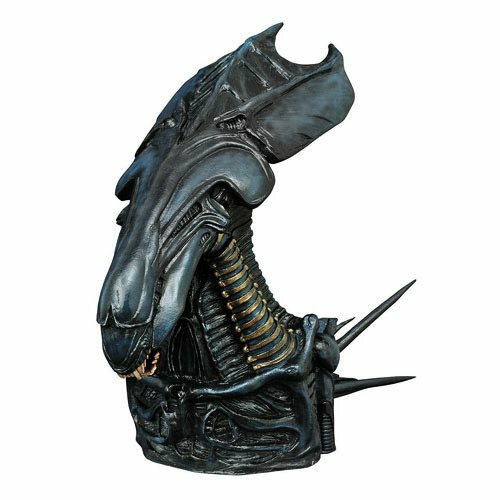 Based on the matriarch's appearance in Aliens, this beautifully rendered bank features a detailed sculpt by Eli Livingston and a collectible-quality paint application. She has a coin slot in back and an access door in the base, so she'll guard your quarters like they were her own children! If you were going to put all your eggs in one basket, this is it! Comes packaged with dorsal spines. Bank stands 8-inches tall 8 1/2-inches long and 6 1/2-inches across. Ages 8 and up.